4 Beds 3 Baths 1 Partial Bath 2,174 Sq. 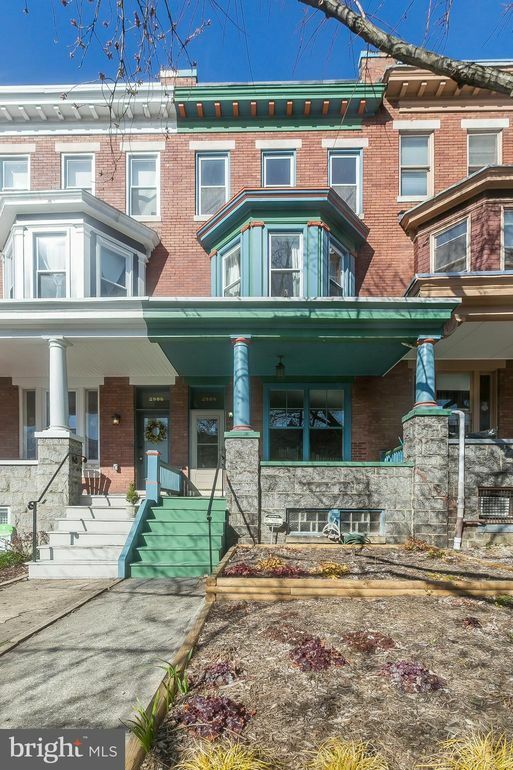 ft.
Quintessential Charles Village porch front townhouse on a fantastic block of Guilford Avenue. Spacious room sizes with over 2100 sq ft of living space, gleaming wood floors, sun-filled rooms. First floor has living room with beautiful picture window and custom millwork, dining room with decorative mantel and space for your largest dinner parties, powder room and renovated kitchen with granite countertops and stainless steel appliances. The second floor has two bedrooms, large family bathroom with soaking tub and separate shower, laundry and rear deck. The third floor has two bedrooms, one of which has an en-suite bathroom with a shower. Large deck off the kitchen, gracious fenced rear yard with grass and perennial beds, front yard designed by Edible Eden with native plantings and 1 Car detached garage. Basement is unfinished with walkout and space for additional living space, studio or workshop. Lots of updates including new porch roof, Gas Forced Air Heat (~17), Hot Water Heater (~19). Conveniently located steps to Hopkins Homewood Campus, Hopkins Shuttle, Waverly Farmers Market and across the street from the Motzi Bread Bakery opening soon. Subject to the Charles Village Benefits District Tax. May be eligible for JHU $17, 000 LNYW grant. Buyer to verify availability of funds. This baby won't last long!